Inspired by the Sea Bass, this eye would be a great compliment to any lure. Available in many sizes, to meet the needs of most lure designs. Available in 16 sizes and four backings. Inspired a Shad, this eye would be a great compliment to any lure. Available in many sizes, to meet the needs of most lure designs. Available in 16 sizes and four backings. 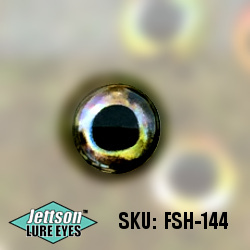 Inspired by the Smallmouth Bass, this eye would be a great compliment to any lure. Available in many sizes, to meet the needs of most lure designs. Available in 16 sizes and four backings. Inspired by the Soldierfish, this eye would be a great compliment to any lure. Available in many sizes, to meet the needs of most lure designs. Available in 16 sizes and four backings. 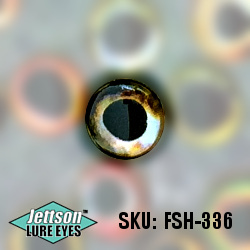 Inspired by the Squirrelfish, this eye would be a great compliment to any lure. Available in many sizes, to meet the needs of most lure designs. Available in 16 sizes and four backings. Inspired by the Steelhead, this eye would be a great compliment to any lure. Available in many sizes, to meet the needs of most lure designs. Available in 16 sizes and four backings. Inspired by the Striped Bass, this eye would be a great compliment to any lure. Available in many sizes, to meet the needs of most lure designs. Available in 16 sizes and four backings. Inspired by the Sunfish, this eye would be a great compliment to any lure. Available in many sizes, to meet the needs of most lure designs. Available in 16 sizes and four backings. Inspired by Sunfish, this eye would be a great compliment to any lure. Available in many sizes, to meet the needs of most lure designs. Available in 16 sizes and four backings. Inspired by the Walleye, this eye would be a great compliment to any lure. Available in many sizes, to meet the needs of most lure designs. Available in 16 sizes and four backings.